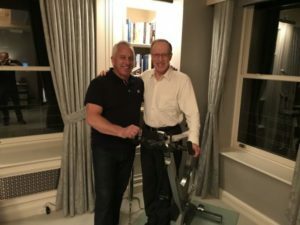 Giants collided when one of the greatest athletes in American history, Greg LeMond visited in the Fifth Avenue home one of New York’s premier developers in Manhattan, Elie Hirschfeld on April 22! Towering New York real estate developer and philanthropist, Hirschfeld, is also a premier triathlete. He has also long been a fan and admirer of three-time Tour de France Champion Greg LeMond. The two first met when Hirschfeld, 67, competed in the 1995 World Ironman Triathlon in Hawaii where LeMond served as a commentator for NBC. Today, Hirschfeld is still competing and winning among his age group in triathlons and LeMond is breaking new barriers in sports technology. “Greg is the epitomy of excellence — not only in sports, but in technology and humanity,” said Hirschfeld. LeMond is now heading LeMond Composites, a company that developed lightweight carbon fiber materials originally used to produce faster racing bikes, but has now expanded to offer new solutions in transportation, infrastructure and renewable energy!